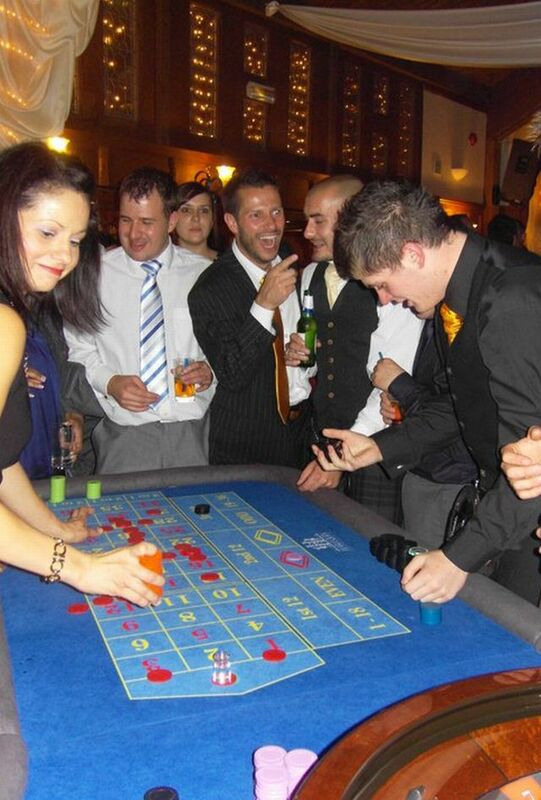 A fun casino is a unique and exciting way to entertain guests at a parties, weddings and events. At Harlequin Fun Casino, we provide full size, authentic casino tables with real Las Vegas casino playing cards and accessories, along with friendly, professional croupiers for your event, who will teach your guests how to play the games if they’re unsure. We aim to make your casino experience as authentic as possible, by providing you with luxurious, beautifully presented, hand finished casino tables, complete with genuine As Vegas accessories and professional staff. We’ve lost count of the amount of times that guests tell us that they feel like they’re at a real casino table when they’re playing at our tables! The experience of a fun casino is very similar to a real casino but the big difference is that at a fun casino, we don’t play for real money. A fun casino is purely for fun, so there’s no risk of losing the inheritance! Guests can play ‘risk-free’ all night long. Just like in the casinos on the Las Vegas strip, the most popular games for evening functions are Roulette and Blackjack. They’re incredibly fun to play, highly addictive and easy to learn, even for complete beginners. The Roulette table looks very impressive at 9 foot in length, and all of our Roulette wheels are casino standard size, which is 80cm in diameter. They look very grand and impressive, and never fail to wow guests. Our Blackjack tables are beautifully hand crafted and exactly the same as the Blackjack tables in Las Vegas casinos. Finished in suede and leather, the Blackjack tables are by far the most popular at any event. Blackjack is very easy to play, and basic strategy can be learned and picked up very quickly, making it almost impossible to walk away when you’re on a winning streak! We’ll mingle amongst your guests before the casino tables open up for play, and we’ll hand everybody the same amount of fun money notes. Fun money is provided by us and is included in the cost of hire. Each guest can bring their fun money up to the casino tables when they are ready, and exchange the fun money notes for casino chips, just like you would with real money in a real casino. The croupier will then hand the player some casino chips, and he or she will use these chips to place bets. Just like in a real casino, the aim is to make as much money as possible with the fun money you’ve been handed. If a player loses all his fun money in the first 10 minutes, we’ll simply hand him a bit more (along with a large dose of teasing of course) so he can keep playing if he likes. The tables stay open for up to three hours as standard, and extra hours can be arranged as well if you think you’d like the casino to feature for a longer period at your function. Many of our clients like to offer a prize for the best player or players, and the most popular prize is a nice bottle of wine or a bottle of bubbly or a nice big box of chocolates. We would be more than happy to provide the prize for you at an extra cost. Please let us know if you’d like us to provide a prize when you’re booking your fun casino. Or fun casino tables have been made with you and you event in mid, so they’re simple to put up and take down, which means there’s minimal fuss when we arrive and when we leave. We always endeavour to set up the casino tables long before you and your guests arrive for the event, so that they are up and ready for play when everyone arrives. When it’s time for us to leave, we’ll dismantle the tables quickly and quietly, leaving you and your guests to enjoy the rest of your evening.